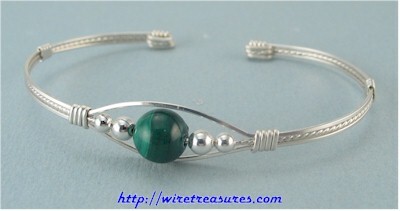 This Sterling Silver wire Cuff Bracelet has as its focus a single 8mm Malachite bead flanked by Sterling Silver beads (3mm & 4mm). Simple but very elegant, you will enjoy wearing it whether you're out just for fun or for adventure. You are visitor number 3,652 to this page.